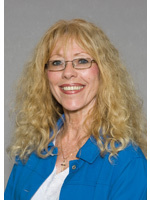 Elaine Hollensbe is a Professor of Management and Doctoral Program Coordinator for the Management Department. She completed her PhD in organizational behavior and human resource management at the University of Kansas. She is currently an Associate Editor of the Academy of Management Journal, and on the Editorial Board for the Journal of Organizational Behavior. Dr. Hollensbe has completed quantitative research on goal setting, compensation and self-efficacy, and qualitative research in the areas of identity, work-life balance, and emotion. Her current research is qualitative and focuses on organizational identity; the impact of mobile technology on work-home balance; role management; organizational identification in exterior employees and employees experiencing mergers; individual influences on sustainability; and intergenerational differences at work. Her research has been published in such journals as the Academy of Management Journal, Journal of Management, Academy of Management Review, Human Relations, and Human Resource Development Quarterly and has been recognized with national awards, including the Owens Scholarly Achievement Award, the Rosabeth Moss Kanter Award, and the Outstanding Publication in Organizational Behavior Award. Dr. Hollensbe teaches classes in the undergraduate, graduate, and doctoral programs has received four teaching awards from the Lindner College of Business. She is a Fellow of the University's Academy of Fellows of Teaching and Learning, and is both a Research Fellow and a Teaching Fellow in the Carl H. Lindner College of Business. She also is involved in designing and facilitating executive programs and workshops on leadership, team building, and work-life balance. She has a BA in Journalism and Mass Communications from Iowa State University, and an MBA from the University of Missouri-Kansas City. Prior to completing her PhD, she was an academic administrator and a communications consultant in Kansas City. Sponsored by: WSOM Design & Innovation and Organizational Behavior Depts.